With its strong, bendable wire interior and sturdy rubber exterior, the Nite Ize 12" Gear Tie is the perfect size for bundling, connecting and organizing everyt..
Gear Tie, Gear Tie Color Lime, Gear Tie Length 32 In., Diameter 6.6mm, Material Rubber, Steel, Temp. Range -30 Degrees to 170 Degrees F, Resists UV and Water, I..
100 feet of GSA-compliant paracord; great for everything from camping to paracord jewelry! It is made by a certified U.S contractor550 Lb. Test - 7 Strand CoreM..
Merlin MLNCH Safety Cover Y-Strap Merlin MLNCH Safety Cover Y-StrapdetailedDescription":"Merlin MLNCH Safety Cover Y-Strap Manufacturer Part Number：MLNCHBrand：M.. Description: Polypropylene webbing is a soft, flexible fabric of woven fibers. Made from thermoplastic resins, this versitile material is perfect for outdoor us..
Get assistance in your upper and lower body stretches with the Xerstretch Strap. Designed for safe, full-body stretching, increasing flexibility and improving y.. This tough 1/4-inch white braided polypropylene cord comes on a reusable spool and has a hollow core. Coghlan's Ltd. is recognized as the world leader in outdoo..
Coghlan's Utility Strap is a great piece of camping gear. Strong one-inch (2.5 centimeter) polypropylene strap. Sewn on buckle. 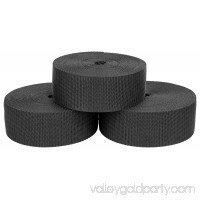 Easy to cut and seal to desired ..
Nylon webbing is a medium-weight material and is stronger than polypropylene webbing. In addition, it is easy to care for as it is machine washable. (We recomme.. Polypropylene binding is a soft and durable tape made from woven fibers. Flexible and easily sewn, polypropylene binding is perfect for edging projects. Essenti.. These Nite Ize Figure 9 Carabiners tighten, tension and secures ropes without knots. Whether tethering a canoe to your vehicle, anchoring boxes to a dolly or bu.. Polypropylene webbing is a soft, flexible fabric of woven fibers. Made from thermoplastic resins, this versatile material is perfect for outdoor use due to it's.. Secure your cargo with Ozark Trail 4-Pack 10 FT Ratchet Tie-Downs. Important gear requires secure transport, and this 4 pack of ratchet tie-downs is up to the c..
Gear Tie, Gear Tie Color Orange, Gear Tie Length 12 In., Diameter 4.0mm, Material Rubber, Steel, Temp. Range -30 Degrees to 170 Degrees F, Resists UV and Water,.. These Coghlan's 10" Mini Stretch Cords have innumerable uses. They are ideal for securing items to your pack, for sleeping bags, tents, tarps, awnings and even ..